I couldn't possibly care less about anything related to the NFL, no matter how cool it is. Well... I could be pursuaded if there was free beer, nachos, and I didn't have to be engaged on any level by anything related to football. Since some of you might care a lot more than I do, here you have the opportunity to attend the offical NFL Draft Picks activities, being casted by 1 iota! 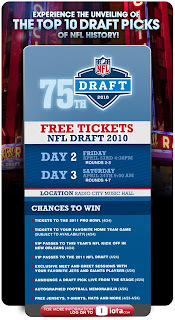 We are looking for thousands of fans to attend night 2 (rounds 2-3) and day 3 (rounds 4-7) of the 2010 NFL Draft! Experience the unveiling of the top 10 Draft picks of NFL history! Get ready for an experience of a life time! If you are a sports fan, this is the event for you! For the first time in history, the NFL Draft goes primetime with Round 1 slated for 7:30 p.m. ET on Thursday, April 22. Rounds 2 and 3 will be held on Friday, April 23 beginning at 6 p.m. Rounds 4-7 will be held on Saturday, April 24 beginning at 10 a.m.
Night 2 of the Draft will feature members of the Top 10 Most Valuable Picks as well as the 2010 NFL Hall of Fame Class. The order of the Top 10 MVP's will also be announced at the conclusion of Round 2. Day 3 will feature player autograph signings as well as cheerleader and other celebrity appearances throughout the day. It will also be the last opportunity to see the Lombardi Trophy and a collection of Super Bowl rings on display. In addition, fans in attendance will be a part of the NFL Network and ESPN live TV audiences.A collectable pin set will be given to fans attending the Draft, with a unique pin handed out each of the three days. Held in New York City since 1965, the NFL Draft will be televised nationally by NFL Network and ESPN. This is the fifth consecutive year that the Draft will be held at Radio City Music Hall. To request free tickets click here. I often use domain suggest a tool to find a domain name. Some of the bloggers advise to avoid the exact match domain name, how your opinion ?